Complete our form or call (412) 916-0119 for an expert painting estimate. 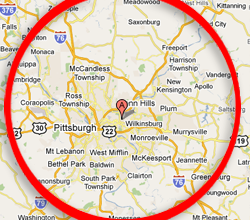 We are located within the Pittsburgh metro area to serve you quickly. We want to answer any questions you have about our painting services. If you are one of our satisfied customer, we'd appreciate your feedback. "ESP Painting organized and completed the preparation and painting of a residential home, as well as surrounding elements. The scope of the project included the painting of the front, back, and sides of a house. It also included detail work around windows and decorative header elements, as well as rejuvenation of iron work included on, and around, the property. From beginning to end business owner, Eric Piacenti, and his entire team were very impressive! From the initial consultation through clean up, the experience with ESP Painting was superb. Eric listens to your desired end result, analyzes the project, and makes valid and reasonable suggestions based upon his years of project experience. Mr. Piacenti captures detailed notes and is extremely knowledgeable, organized, and thorough. The onsite team arrived promptly, as well as demonstrated an exemplary level of care, competence, and courtesy while working on the project. ESP Painting is a extremely professional organization with a genuine commitment to both details and quality. They take great pride in delivering your vision, explaining concepts in detail, and possess a high degree of workmanship and service!" "Hi Penny - I just wanted to give you an email regarding the great work that Eric Piacenti & his crew have done for me, my buyers as well as my sellers. There is nothing they can't do - their wallpaper removal or painting over, their attention to details as to crown moldings and special woodworking treatments (down to gluing the corners or miter joints prior to painting) I have used them several times over the past 5 years and all of my clients have been extremely pleased with their attention to detail, the quality of their work, the politeness of his staff, and the results in the transformation of an old & worn shoe into a tasteful, clean and transformed home. Eric and his crew make my job easy once they have put all their appointments in my ’distressed’ listings. I have given him some tough people to work with and all of them have told me he & his crew have far exceeded their expectations in the workmanship & pricing - one client didn't want to move after they finished his home. As an agent, I personally want to say ’thank you’ to you for choosing our subcontractors so well and making our jobs a ’little’ easier by having people, through you, at our service. It is like shopping at SAKS vs. Macys with our Concierge’s picks. Thank You, Penny, for a job WELL DONE." "ESP provided quality work. The painters were friendly, neat and professional. I would use their services again." "Great painting job. The crew was very professional, and were very concerned about our satisfaction. Started when they said they would, finished on time. No problems at all." "Eric and the crew did a great job! The arrived when they said they would and completed when they said they would. They were polite, professional and when complete, they left only a beautifully painted home! I would highly recommend them to anyone for any job!" "Unbelievable job. ESP Painting is the most professional painting service I have ever used. I will be contacting them for future projects and suggest that others do the same." "Very professional from Eric to all painters. Exceptionally organized, prompt and courteous. The quality of their work is among the best I've seen in a painting contractor. Price was very fair. While required follow-up was minimal, it was handled quickly and efficiently. I'll recommend them highly to all my friends and relatives." "Big crew. Good availability. Easy to approach about concerns. Nice people." "Everyone was very nice, easy to work with and job turned out great. Thanks!" "Eric was very willing to work with me regarding scheduling and work to be done. They were very neat and there was not a drop of paint anywhere except where it should be. They painted my whole house and it was completed in a very timely manner. Eric is also very good at suggesting things, and not pushy at all. I also had wallpaper done by him. I would highly recommend this company to everyone and I look forward to doing business with them again." "I was very pleased with the work completed. ESP went above and beyond to ensure that my colors looked exactly as I expected and that the job was handled to excellent standards." "ESP painting was one of the best quality and professional contractors we have ever worked with. Eric will certainly get all of our business." "Eric was the first contractor to return my call when I started looking for contractor quotes, and he was the first to arrive to quote. He sent his bid by email about two days after looking at the house. The bid/contract was extremely detailed, and that professionalism impressed me.... He had promised me that once they started my job, they wouldn't leave it for another job, and they did just that. His crew is just terrific. Pete, the crew chief, is a real artist and a perfectionist. All of them were a pleasure to have around. They left the property clean every night, and when the job was finished, Eric appeared to organize and label leftover paint, inspect the work, and make sure there were no problems. Good experience." "Great! Eric's team was punctual, efficient, and clean." "Excellent! Eric and his staff are very professional. Initial contact was returned quickly and I recieved a written estimate in a very timely manner. Work was well done and we plan to have ESP Painting come back in the future." "Eric and crew were able to work distractedness as we packed and moved boxes and furniture. They got everything done in the time period and even disposed of old paint. They put any paint left in labeled containers on a shelf in the basement and helped us out by also taking my plastic grocery bags." "Eric was prompt to perform the services within the time frames stated. Our tenant kept us informed as to the performances of the services. The job was completed to our satisfaction. It is important that we find professionals that can work unsupervised and complete the contact with pride and to the best of their ability as promised." "Eric bid on interior painting work I was having done in my home and I was very impressed with his professionalism." "It went very well. Eric is very attentive, organized, sensitive and accessible." "Overall, we had a great experience. No surprises. Our impression was that we would get a quality paint job from a company that does not try to cut corners. We were right. Both Eric and his painters pointed out things that may need fixed. The painters were very hard workers. They also encourged us to let them know if we found any missed up areas or any errors. Eric was good at keeping us updated on the schdule. We are very pleased with our experience with ESP and will contact Eric again to paint for us." "They did a great job! I would highly recommend them, they always call back and are willing to go the extra yard. Very professional!" "Professional interview, quick well written quote and performed the painting very quickly with a crew of five. Eric the ower is a great businessman." * Local neighborhood / area references are available upon request. *. Copyright © 2009 - ESP PAINTING | Marketing by Higher Images, Inc.